Somehow all of my social events for the summer lined up on the same weekend. I took Lucy out to the library early so she would be supplied with reading material, and then was picked up by Dave Gross to go to the first Look Park Craft Beer and Wine festival. 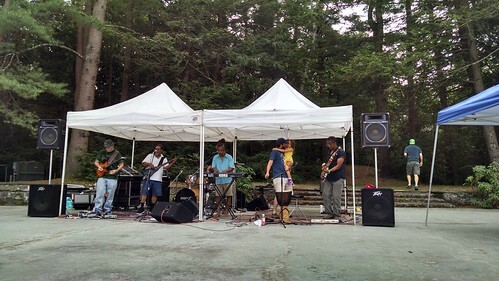 It was held in The Pines, an outdoor theater at Look Park. I suggested we arrive a bit early to aid in finding a place to park. We were walking up right as they started letting people in. They were efficient at handing out tickets, checking ID, and putting wrist-bands on people. In short order, we were inside. Dave and I found a place to set up at the end of a table and we started off with a glass of BLDG8. Then we started trying other things. My only peeve was that their printed guide was incomplete and did not correspond with reality. If you held it upside down and looked through the paper, some of the booths lined up with their actual organization. But a bunch did not. Eventually I decided you would need to fold the guide into a tesseract for it to work and discovered that neither Buzz nor Dave had read A Wrinkle in Time. Shocking. Tom Hoogendyk had his children and was able to keep them both entertained AND still have an adult conversation or two. The music was nice. It was a touch loud for my taste, but much better than almost all similar venues lately. I loved seeing the rasta singer dancing, singing, and carrying his daughter. Charming. After trying a bunch of things, I began to just go back to the BLDG8 booth to get more IPA. Dave gave me a bit of a hard time about not being willing to try new things. I countered that I had tried at least a dozen things. The next time I came back to the table with a glass and took a meditative sip, "Now that's good!" I said. Dave looked on with interest and asked "Is that the Hydra?" Shortly after I got home, Alisa and I left for a party at Cinda Jones' house. She always brings together interesting and eclectic groups of people. The theme this year was Christmas in July with lobsters. Alisa brought something to share for the party. I took along a case of BLDG8, but Alisa kept it on the QT and doled them out only for the people who would really appreciate them. It was kind of charming and subversive. I was pleased to meet Monte Belmonte. He was interested to learn I was John Hodgman's official Esperanto translator. He took a picture of me to mention it to John, who promptly sent his salutations. On Sunday morning, I mentioned to Lucy, in telling her about the party, that lobster was OK, but I liked crab better. Lucy said she's basically never had lobster. I suggested that I should take her for a lobster roll at McDonalds -- a plan we put into action immediately. As you drive toward the Cape, you start seeing lobster rolls advertised everywhere and we'd gotten them a couple of times, so I had some idea what they were supposed to be like. The McDonald's lobster roll is a solid contender: the lobster was good and the roll was fresh and tasty. But I still like crab better. In the afternoon, I convened our local Esperanto group at Hangar to meet with Julie Schwartz visiting from Boston. She was mostly visiting to attend a party in the evening with another friend who lives in Amherst, but we took advantage of her trip to chat for few minutes. We had Julie and Julie, Rodger, Roger, Sebastian, and Lucy. And me. Julie is also a co-organizer of ARE so it was nice to talk about that face-to-face for a few minutes too.